MAW: A Community Celebration of the Vocal Arts is an immersive experience of voice in all its permutations. 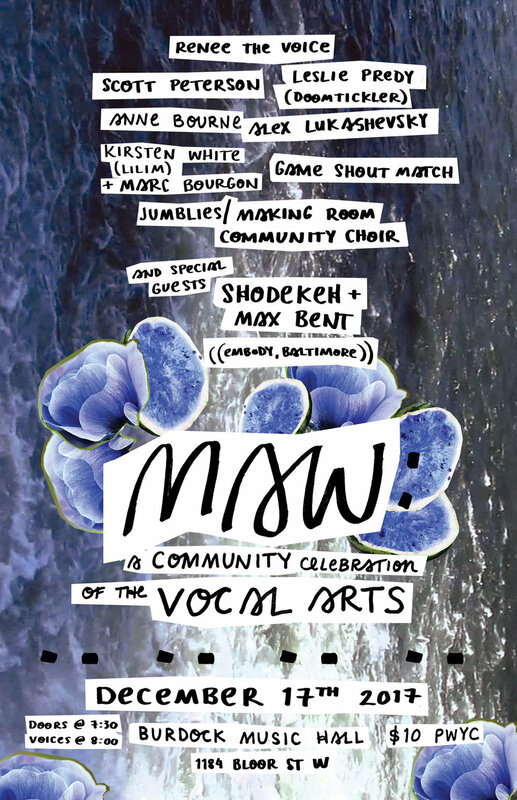 Often blurring the roles of audience and performer, MAW brings an array of vocalists together who might otherwise never identify as a community: storytellers, sound healers, choirs, and beat-boxers have graced our stage amongst sound poets, vocal improvisers, singer-songwriters, and more. We welcome all forms of diversity, and invite unique vocalizers to make our stage their home. How do I share my voice? MAW extends an open invitation to vocal arts community members who want to share their voices on our stage. Send an email to mawvocalarts@gmail.com. Include any links to samples of your voice work, or any website or social media page that describes what you do. You're welcome to write a short paragraph about your voice practice if you don't have any links. We are open to beginners and seasoned vocalizers alike. Our shows are Pay-What-You-Can at the door, with a $10 suggestion for those who are comfortable offering that amount. MAW guarantees that every performer will have their travel expenses covered (for local acts this usually means transit or taxi fair), and when the door charge is counted at the end of the night, we split whatever money remains after these travel expenses are paid. The venue, Burdock, offers one drink ticket per performer. Yes, but it depends on what is available. At the very least, we make a poster for each event, and we take photos of the event as it happens. We have a facebook page and instagram account where we try to share photos and short videos, but if your voice is being recorded, we will ask your permission first. Where and when does it take place? How accessible is the venue? Burdock Music Hall is our home, located at 1183 Bloor Street West (corner Pauline). The venue has one step up to it, as does the stage. Regrettably, the only bathroom in the venue is down a flight of stairs, but there is a Pizza Pizza at Brock and Bloor (two blocks west) that has an accessible bathroom. There is a green room available to performers, also regrettably up one flight of stairs. If you need any other accommodations, such as an earlier performance time, please indicate what you need in your email to MAW Vocal Arts.